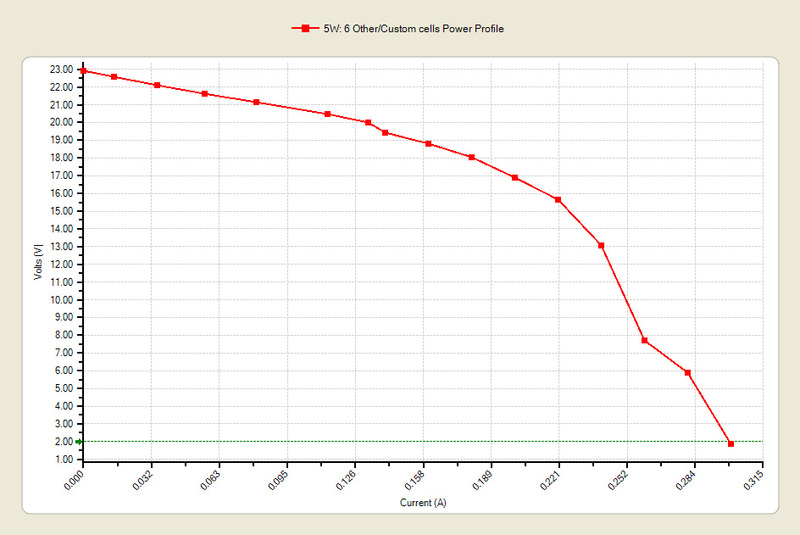 Solar panels have a dramatic drop in output voltage as the load increases. 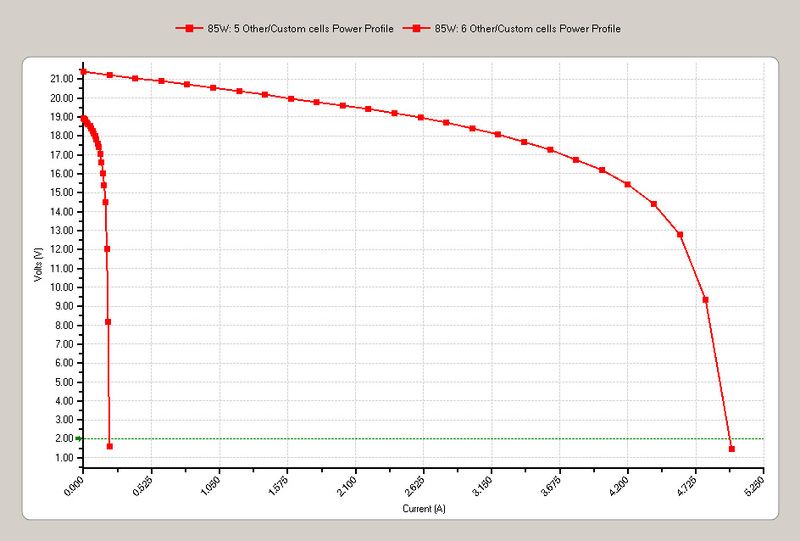 The CBA IV has the ability sweep the solar panel, by varying the load, to see how the panel reacts. 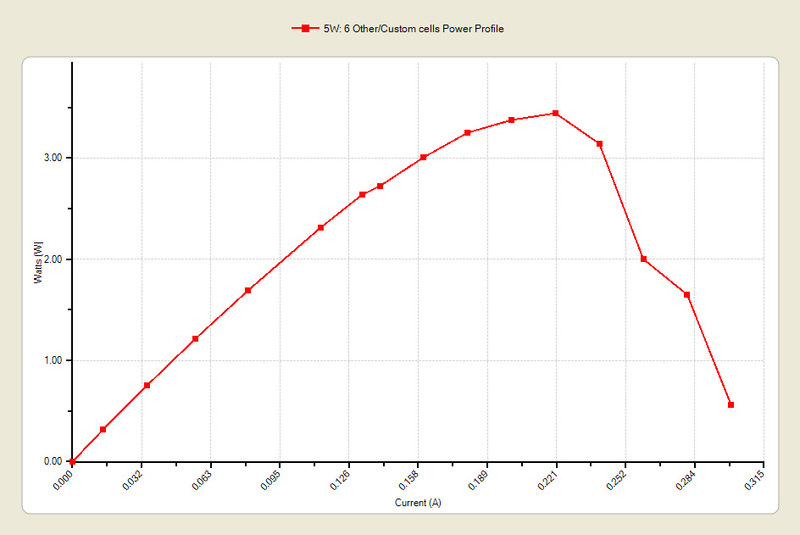 The below charts (5W and 85W panels) shows a simple current vs. voltage chart in direct sunlight for one panel. Note how the load becomes greater as the voltage drops; until there is a point at which the panel is of no use. 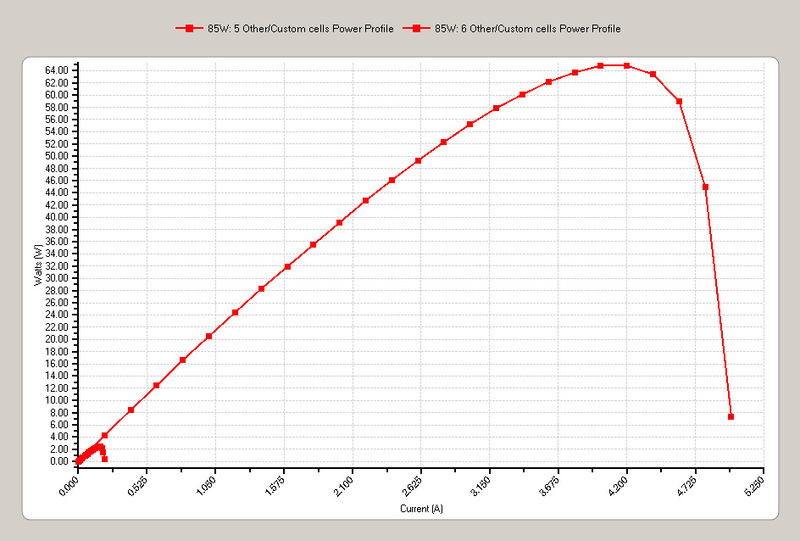 It is important to look at the solar panel characteristics to determine the charge level needed for charging a batter. An interesting characteristic of a solar panel is what is referred to as the maximum power point. 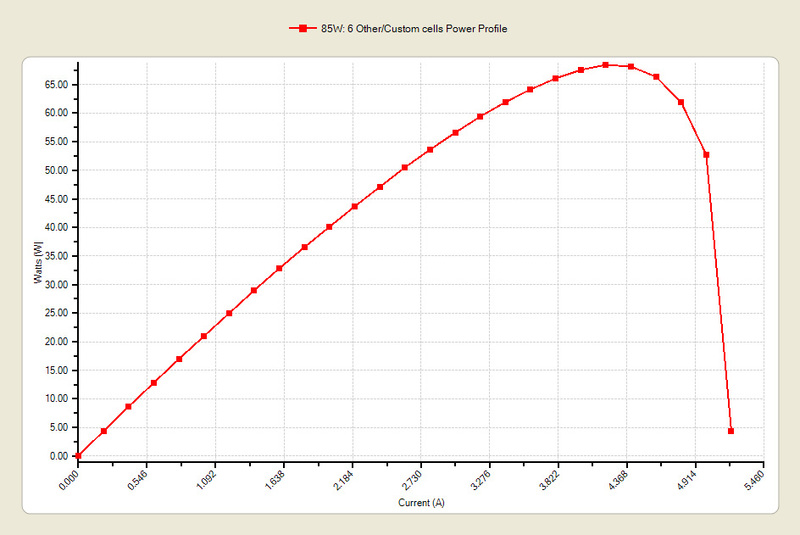 Multiply each point on the graph by the voltage times current to get power, as show on the below graphs. 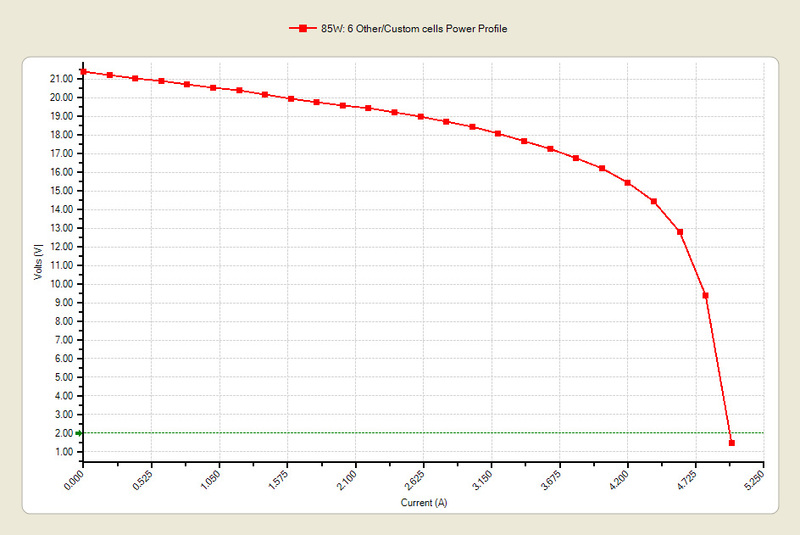 Note how the power output from the panel has a sweet point (or semi-sweet range). It is in this range of a load that the panel delivers the most power. Using a solar panel to charge a battery this is the charge level you want to use. It is good practice when characterizing a panel to try it under different sunlight conditions. For example bright sun directly to panel, bright sun at an angle to the panel, cloudy day, so on and so forth. The chart below shows the top line from direct southern sunlight exposure vs. indirect sunlight pointed to the north. In order to charge a battery from a solar panel, it is possible to connect the panel through a diode to the battery. Controllers will regulate the charging to manage an optimum charging algorithm for the battery and/or to maintain the maximum power draw from the panel. Some controllers pulse the power from the panel at a low frequency to regulate the power and others are essentially a switching power supply to translate the voltage to the desired voltage and to regulate the current. The primary concern for radio use to to be sure to pick a controller with low RF noise. Many want to use a solar panel with a powergate like PG40S as an alternate way to charge the battery when away from AC. Connect the solar charger directly to the battery along with the powergate PG40S. Usually use of a controller between the panel and battery will provide the optimum charging.